Hard to believe but it's been over thirty years since "Mr. Showmanship" has passed away. 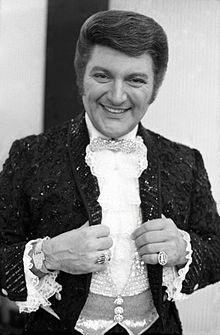 Liberace, who's career spawned four decades, was one of the world's most successful entertainers prior to his death on February 4, 1987. Throughout his illustrious career he was honored with two Emmy Awards, six gold albums, and two stars on the Hollywood Walk of Fame. Pretty impressive for a guy who grew up as the son of a poor immigrant from Italy. Now comes the news that this beloved entertainers life story is headed to the stage. The show, which is based on the 2013 Emmy Award winning film Behind The Candelabra, has been in the works since 2015. As of now no creative team or cast have been announced. Stay tuned to this blog for further updates. Until next time theatre fans.